This racerback tank t-shirt pattern is our sixth pattern on our workout wardrobe series. I hope you have enjoyed the collection so far. It is spring already, Yikes! I woke up today as if I had been struck by a bolt of lightning and realized half the year is gone. Where? Do I want to know? Not sure… Time seems to slip through my fingers lately. Moving on… that is the point of this wardrobe to move with comfort. 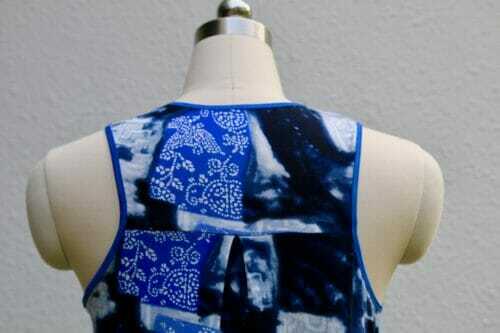 This racerback tank t-shirt pattern is very functional because you can use any double jersey fabric and make it. It is not meant to be tight on your belly and is higher at the front than the back. It goes perfectly with the sports bra we have already worked on. A box pleat on the back will help accommodate a larger chest area. 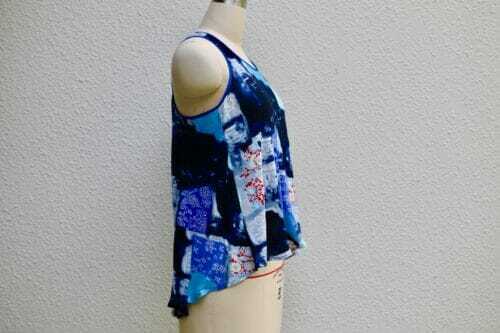 This racerback tank t-shirt pattern has only three pieces so it is easy to assemble and sew. 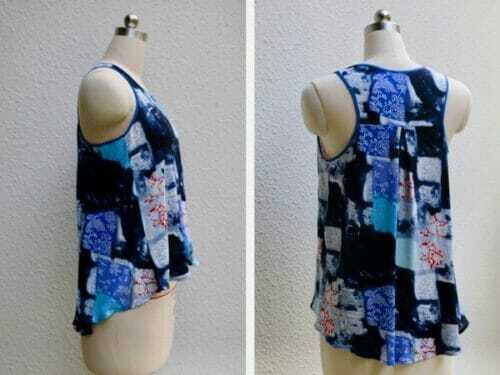 This top is easy to make in a couple of hours. 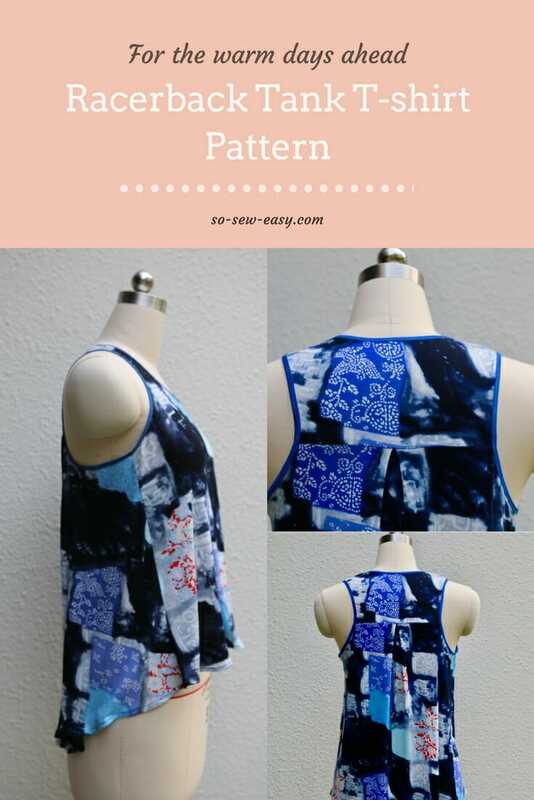 You can download the pattern for this Racerback Tank T-Shirt from our account at Craftsy. Use Adobe Reader to download and print the pattern. Print on Landscape and use the Actual Size setting. The seam allowance is 1/4″ and there is 1/2″ of hem. 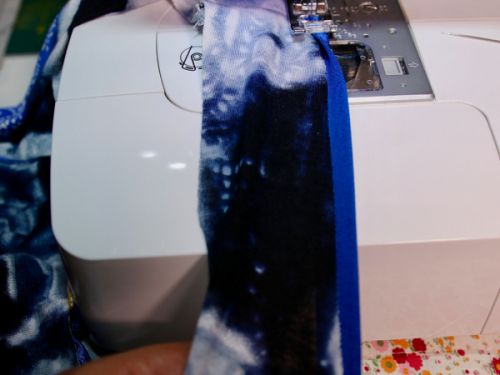 Use a serger to expedite the work if you have one. Using a normal home sewing machine will be fine too. 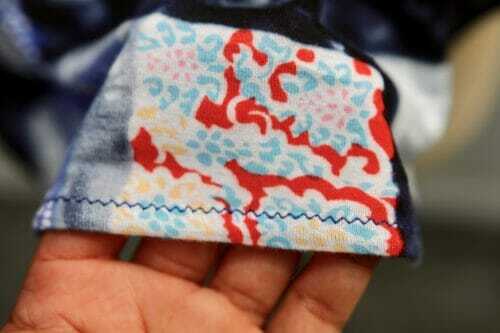 If using a sewing machine only, use a ballpoint needle and a very small zigzag. 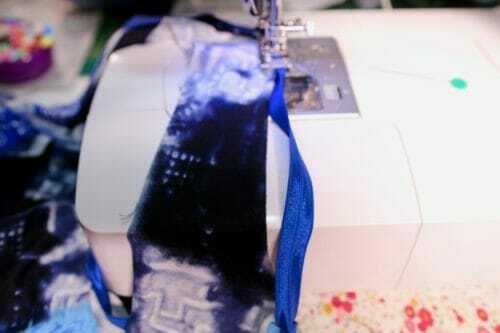 I have used an elastic but you can also make your own bias tape if you have enough fabric. 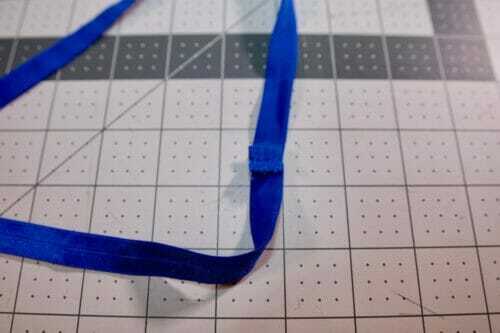 I did not, so I went with the fastest easiest way and used the same elastic I used in the sports bra. 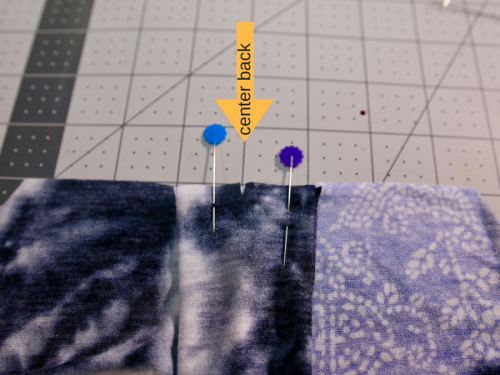 If you find the top not long enough, follow the same procedure on this tutorial on how to lengthen a top. Pin the paper pattern on the shoulder and on the side and place it on your shoulder. If you are not happy with the length follow the tutorial on how to lengthen a top. This racerback tank t-shirt is made of two pieces, the top, and bottom. We will be working on the bottom half first, where the pleat is located. The first thing we have to do is to make the pleat. Take the second notch from left to right and fold it to the left. We will be reversing the procedure to make the other side of the pleat. Take the second notch from right to left and fold it to the right. You will need five notches to make the box pleat. Place the top half piece print side down. Sew the two back pieces together use the serger or the sewing machine. As you can see in my picture I am using a very small zigzag. Turn the back piece print side up. Place the front piece and pin it at the shoulder to the back piece. 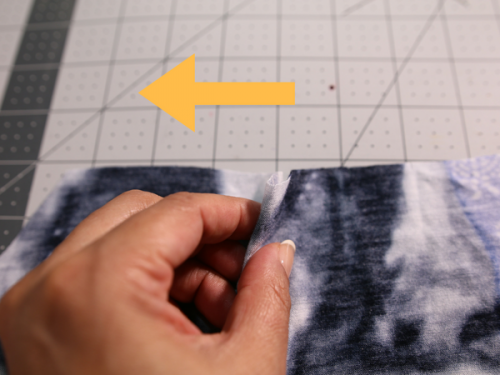 Sew the sides at 1/4″ using your serger or a small zigzag in your sewing machines. 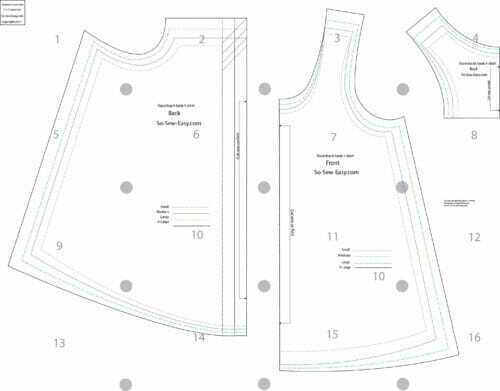 We will be using the same procedure for the neckline and the armholes. 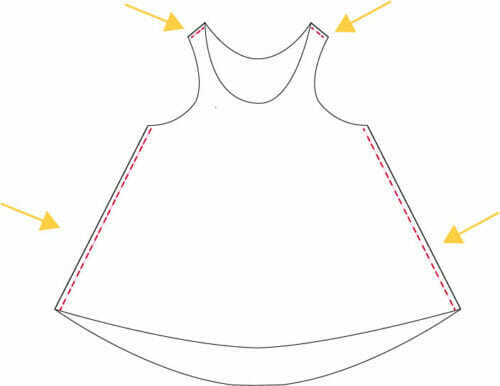 Measure the neckline and cut the elastic two inches smaller than your measurement. In my case, the neckline is 26.5″ so I will require a 24.5″ elastic. 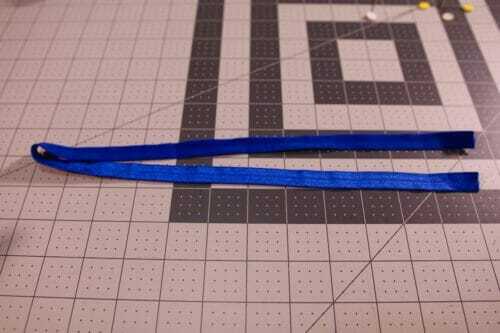 Sew the elastic at 1/4″ to form a band. Divide the band in half. Place a pin or mark it with tailor's chalk. Divide the neckline into half. Pin the elastic band where the arrows are shown below. The arrows represent the neckline divided in half. Pin the elastic seam allowance to the back of the top seam allowance, this is to reduce the bulk. Otherwise, it will be too difficult to fold the elastic if both the top seam allowance and the elastic seam allowance are facing each other. 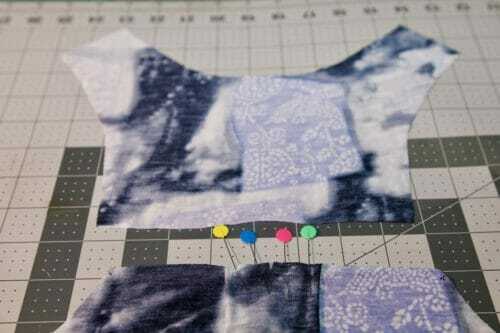 You are going to sew the elastic down using a medium to small zigzag. The bigger the stitch the more noticeable the zigzag will be, but it needs to be big enough to maintain the elasticity. 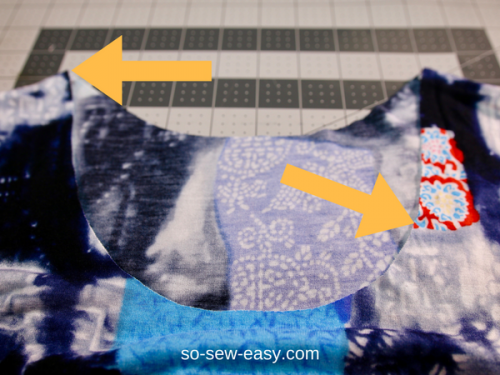 Start at the shoulder but away from the seam allowance and pull the elastic as you sew, don't pull the fabric. 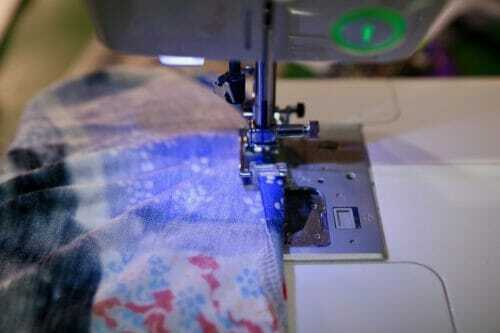 This is not difficult if you use your right hand to pull the elastic and your left hand to guide the fabric. Never pull the fabric at the back of the machine with your left hand when sewing knits. This will cause to distort the fabric and possibly break your needle. 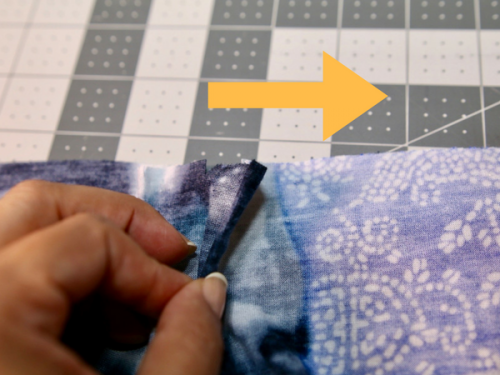 If you're using bias tape from the same fabric follow the same instructions on Step Three on the high and low t-shirt. 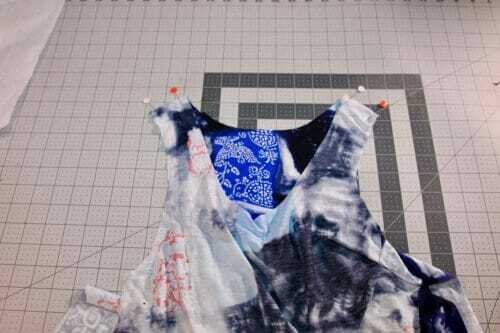 For woven bias tape follow these easy to make a t-shirt, where I use the same fabric as the racerback tank top. My fabric is a rayon knit and requires a very thin stretchable interface to be able to use a twin needle which by the way would be the ideal way to hem this top. But, since is a soft fabric and drapes well I have decided to skip the stretchable interfacing. 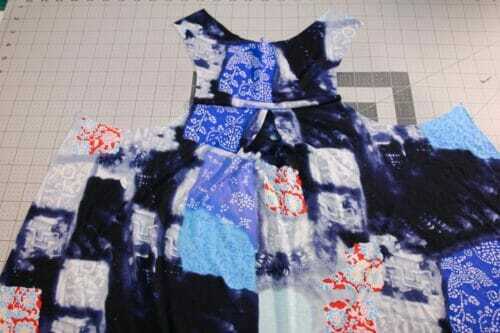 This is because the fabric has a busy print, the pattern is flared at the bottom and I am using rayon knit. Rayon knit is perfect for the summer because allows your skin to breath and it is super soft. 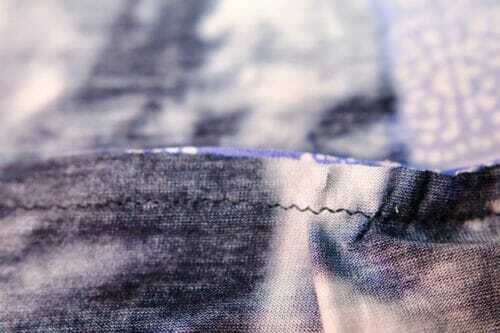 I have serged the hem folded 1/4″, folded again 1/4″ and used my ballpoint needle with a small zigzag to sew the hem. The lack of interfacing will leave the hem slightly wavy, which is something that I would never recommend if the fabric had a solid color. If you do not feel like being adventurous use the technique on this tutorial (step five) where I hem this summer dress using homemade strips of stretchable interfacing. Hope you enjoyed this tutorial. I have the perfect walking shorts for this top. Until next time. Please let me know your thoughts or questions in the comments below. 55 Responses to Racerback Tank T-shirt Pattern, for the warm days ahead. Thank you for sharing – I can’t wait to try this! It is my pleasure Linda, hope you like it. I can’t find the link for the free download? It is under the heading Pattern Download. I think I would like to make this top but not the racer back style. I don’t wear sports bras and I don’t like my straps showing. Can this be modified? Or do you have another top like this but with a regular back? This top was design to go with the sport bra shared with you last week nothing will show. Would this pattern work if you made it in a soft cotton? No you need the stretch for the top part. But, if you are under size 8, you could try to make it on a bias using a larger size. try that and let me know how you did. Send me your picture and I will add it to the post for people to use it as reference. Happy sewing! The directions refer to notches ie. start with the second notch left to right, however there are no notches on the pattern. Hello Barbara, Just make the outer side and make a pleat int he middle with the remaining fabric, if you follow the instructions you will make a boxed pleat and do not need the notches. Hi Maura, you mention in the instructions that woven bias tape could be used on this project. I have some patterned woven bias tape I would like to use, with a plain knit. Do you think it will be a problem that the bias tape doesn’t stretch although the fabric will? HI Hope, I would use the tape, it will give stability to the neckline. Just make sure the neckline is large enough for your head. Hi Marita, it sounds to me you are scaling the pattern. You need to print the 2″ x 2″ square test first. Print using adobe reader on Actual Size. Hi Michelle, Mea culpa! Mea culpa!!! this keeps happening and I have to say it is because I recycle the PDF for Cratfsy. Entirely my fault, but thanks for the feedback. On the pattern pieces it says to cut 2 pieces 4″x22″? But I don’t see where they are used in the instructions. What am I missing? Hi Michelle, You do not need that at all! the actual material list is in the instructions, I have to change that page which is really just to show you how to print the pattern. I might have made a mistake on the numbers i will update you on the patterns published so far. the 2 inch scale box on the pattern measures up correctly but my quarter dots aren’t perfectly aligned. are they supposed to be? Yes, Natalie, they are supposed to align. I do not use USA paper dimensions and you will have to trim the paper. Sixth pattern? Is there a link to the other five? I have definitely missed a few! I really am enjoying these patterns, thanks for taking the time to share them. You are welcome Millisa, I will send you all the links soon. Hi, printed the pattern yesterday and made the top today. I really like it. Easy to sew and easy to wear. I did a rolled edge on the hem. Worked like a damn. Thank you so much for this pattern. Going to make more. Can you tell me what other workout wardrobe series patterns you have share and how I can find them? Thank you! HI Mary, I will post them all together for you to be able to save to your computer. Thank you for your patience. I have the pattern pieces put together except 13 and 14 don’t seem to fit across bottom of 9 and 10 as seems to show. Plus 14 has part of a rectangle with arrow pointing down to line like it should connect somewhere that says fold here. Hi Rose looks to me you have printed the pattern on portrait rather than Landscape. Please have a look at the post where the pattern layout picture is. If you are still having problems send me a screen shot at mayra@so-sew-easy.com. Happy to help you. Can you (or maybe you already do and I just can’t find it) please include finished garment measurements for each size on your patterns? I think many of us would find those numbers to be extremely helpful, especially considering I know how much wearing ease I like to have in my garments, so starting from a finished measurement is always better than trying to figure out dimensions from an arbitrary size chart. Thank you. Great comfy top! Love the soft flare look. Where can I find the sizes and also can it be adapted to a light cotton fabric? Yes the soft flare is very useful to keep cool, I just updated the post and the finished measurements chart is there. where can i find the size chart. really want to make one but don’t want to waste material if it won’t fit. Great pattern! Thank you!! Printed it out and can’t wait to try it. Where do you get the elastic binding? HI June, i placed a link on the material list. You might have to buy a few different colors but it is worth it, for swimsuits, bras and tops. I will be using the elastic a lot! It’s a great looking top, but I’ve noticed on a lot of your patterns I’m not seeing the sizing, why is that? Hi, Karen, I forgot the finished measurements but they are there now. Kindly let me know what pattern are you referring to? Hello, I will think about it, in the mean time have a look at this top, it has sleeves. This top looks cool. I might have to find time to make it. Flattering top! Can’t wait to download the pattern! This a terrific tank! Just what I need for summer. Love all the details. Thank you Karen, enjoy your summer! I love this shirt! I’m not sure what I’ve missed so far but I hope to go back and find the sports bra! HI Joice, click the link on this post and will take you to the sports bra. super cute top! Is there a size chart or a finished measurements chart available to help me choose what size to make? Thank you! Hi, Jaimie, I will get on to it, You know I just forgot:( pop in tomorrow night it will be on the post. This looks beautiful & comfortable. Can you please tell me where the sizes are located in the pattern (other than small, medium, large, & x-large)?